Authoring, reviewing, approving and tracking documents that are destined for global regulatory submissions can be a challenge. Submission teams across multiple departments and locations must collaborate effectively to ensure that timelines and agency commitments are met. Storing documents on file shares across disparate locations and emailing them among team members is inefficient, impedes productivity and introduces risk. Regulatory Operations staff often needlessly spend time hunting for the correct version of documents – prolonging their tasks at hand and increasing the possibility of missed deadlines. If these challenges sound all too familiar, our comprehensive full-featured Enterprise Document Management System, Ennov Doc for Regulatory can help you streamline document management processes and increase your operational efficiency. Ennov Doc for Regulatory provides a comprehensive solution to managing regulatory submission documentation. The document inventory is pre-configured in alignment with the DIA EDM Reference Model and includes all required domains, groups, sub-groups and artifacts. Ennov Doc’s metadata-based document model provides the flexibility to adapt this model to your company’s organizational needs. Our intuitive suite of design utilities allow administrators to configure and manage the system without needing IT skills. Ennov Doc’s scalability and security enables you to safely manage large volumes of documents – making it the perfect solution for global deployments. Ennov Doc’s intuitive user interface and efficient search capabilities allow every employee to quickly locate and access the documents they require. The user-centric design and connectivity to Microsoft Office 365 and Google Drive improves user adoption, promotes collaboration and accelerates your return on investment. Ennov Doc provides instant access to documents without requiring MS Office or Acrobat to be installed on the desktop. The integrated PDF Viewer increases security by providing read-access to documents from within application – eliminating the need to download an uncontrolled copy. Integrated document templates, robust revision management, automatic document naming and numbering, inter-document relationships and electronic signature manifestation functionality make Ennov Doc for Regulatory the perfect solution to ensure your Regulatory submission documents are created on time and adhere to your authoring standards. 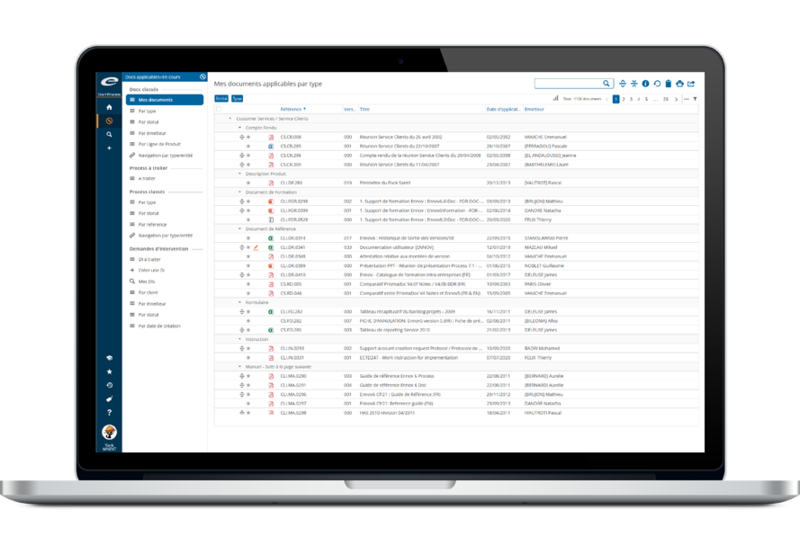 Our customers use Ennov Doc Regulatory to support a wide variety of submission document types including adminstrative, quality, nonclinical, nonclinical report components, clinical and clinical report components. Ennov Doc’s high degree of configurability and seamless integration with our Business Process Management System (Ennov Process), our composite document and publishing system (Ennov Dossier) and our data visualization and reporting tools (Ennov Report) provides them the tools to achieve Regulatory operational excellence. As an added benefit, Ennov Doc fully complies with the FDA’s 21 CFR part 11 requirements (electronic signature, audit trail, records management), making it a perfect fit for regulated industries such as pharmaceutical, biotechnology, animal health, medical device and others.